The site is located in the Northern suburbs of Bristol on Embleton road, Southmead near a primary school. The river Trym rises in Southmead and flows southwest through Badock’s Wood. The Bristol Surface Water Management Plan identified Southmead as an area that has surface water flooding problems and poor water quality in the river Trym. Sustrans worked with Bristol City Council and ran a number of workshops to engage school pupils and the local community about sustainable water management, road safety and street art and urban design. These workshops included an on-street community design workshop during which the locals could work with a street model and trails using turf, so that the community could envision what the rain gardens might look like. Bristol City Council’s Highways Teams were given the designs produced by the community which they adapted and then presented back for feedback. A total of five 10 square meter raingardens were retrofitted along Embleton road and a swale was created in existing green space near the school. The rain gardens were planted with wildflowers that would benefit pollinators in the area. Decorative thermoplastics, inspired by the children’s art, were also placed on the road to further slow traffic. 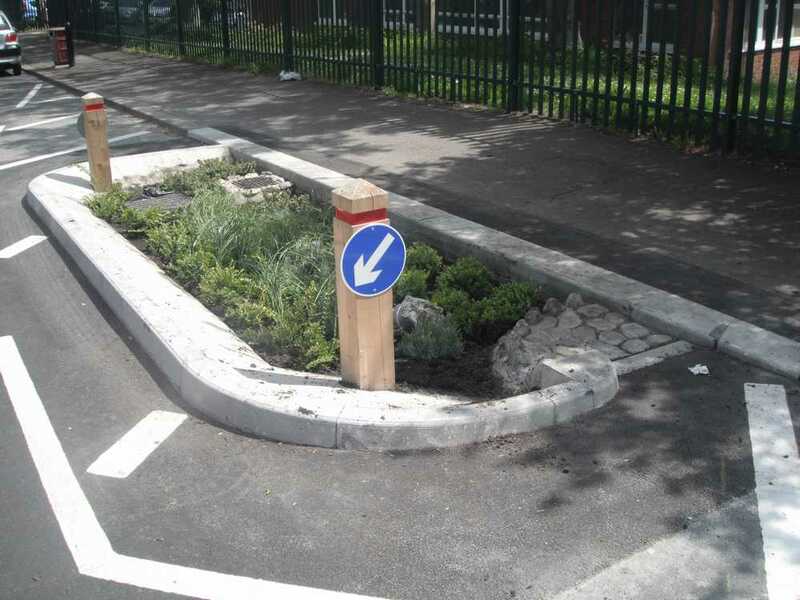 The rain gardens were designed to not only collect and filter surface water but also act as a traffic calming measure outside a primary school. This project has reduced flood risk as well as the speed of cars and subsequently increased walking and cycling. The raingardens and detention basin are maintained by Bristol City Council’s Highways Team and were designed with maintenance in mind. Can be used on most streets suffering from road runoff and flooding or in need of traffic control measures. Community engagement and design in projects can increase communities sense of ownership and young people are keen to get involved in these projects. Rain gardens should not be planted directly under trees as leaf build up can be a maintenance issue. Openings should be as wide as possible. An evaluation package should be created for these projects with regular monitoring to determine the impacts on water quality and flood risk. The project cost £63,400 and was funded by Bristol Green Capital and Bristol City Council.